The craze for Twitter already unleashed and knows no boundaries of language, country, age and operating system, although those who use Linux, did not have available a good customer to manage its participation in the network of microblogging. Luckily this is resolved with the arrival of Hotot, a Twitter client specially created for the system of penguin and comes loaded with a number of interesting features, beating several of the most popular. 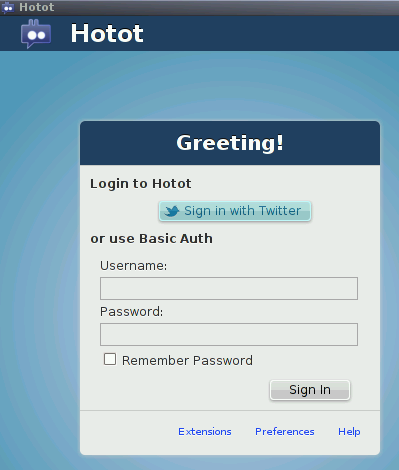 Hotot is based on an intuitive interface, where to go through the visual browsing the options that brings microblogging, and can send and receive tweets, re-tweets, direct messages, multimedia, etc.. If you are looking for more action, you can add functions through a series of extensions that are available for free to the user, allowing you to create a Twitter client to the extent practically. Very attractive when the visual as well as functional, Hotot is very simple to understand and the minutes since you’ve dominated, taking advantage of the best out of your Twitter experience, while enjoying your Linux system.